Here the service provider selects the hardware plan that has been previously created for a given tenant, and assigns the plan itself to this tenant. 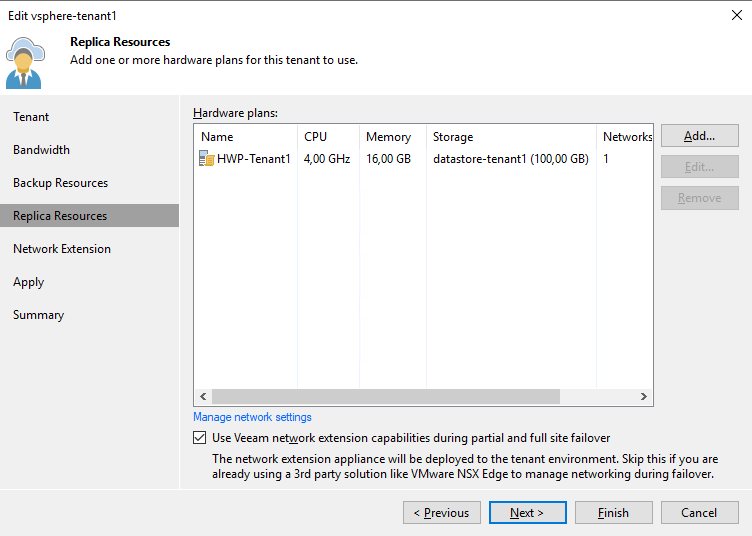 NOTE: we assume during the entire guide that a service provider is going to use Veeam built-in network capabilities via Network Extension Appliances. If a service provider disables this option for a tenant in this step of the wizard, different technologies need to be put in place, but they are out of the scope of this guide. 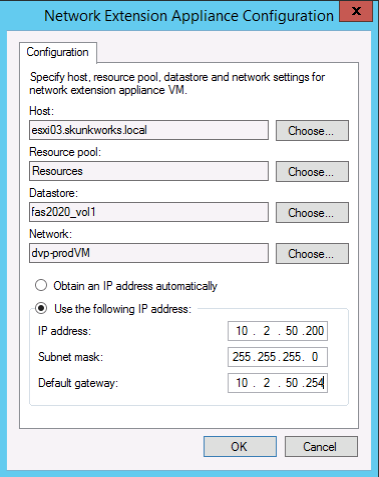 IP address: after the port group has been selected, an IP address should be configured in accordance with the port group: here we are using a public IP address in the same subnet used by the cloud gateways. 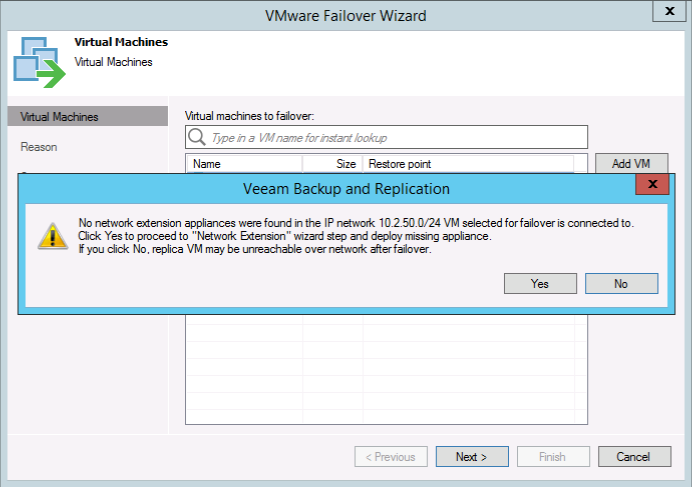 This IP address should not be in the pool configured during the creation of the Replication service, as the risk is that it could be assigned as an additional IP address to another NEA. 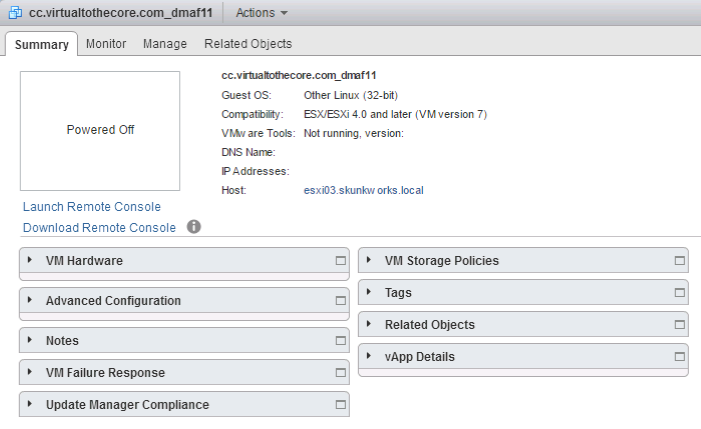 Ideally, service providers should have two different pools, one loaded into the Cloud Connect configuration so that they can be assigned as public IP to tenants that need to publish their VMs over the internet, and another pool not loaded into Cloud Connect, but just used to configure the primary IP of each NEA. We can see in the information of the VM that there are two interfaces, as we configured this hardware plan to have 1 network with internet access. 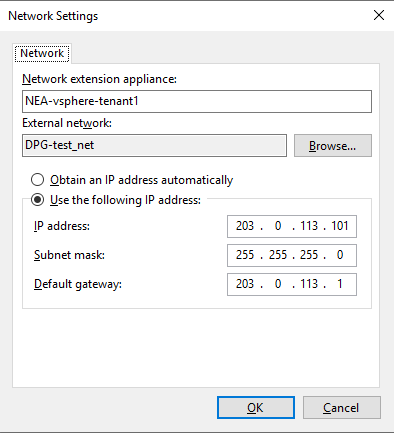 External interface is connected to portgroup "DPG-vcc_public" (the shared VLAN where all the public IPs are published) while internal interface is connected to portgroup tenant.Tenant1.vlan112. 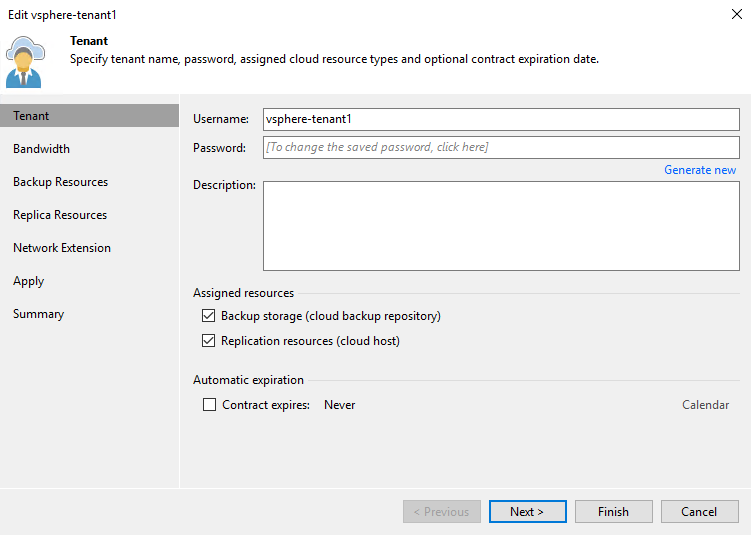 This is a completely new port group that Cloud Connect created for this tenant, and the naming scheme is self-explaining: this is a portgroup created for tenants, specifically for Tenant1, and is using VLAN 112. If you check figure 4.11, VLAN 112 is the first ID of the pool assigned to network with internet access. NOTE: the port group where the external interface is connected is considered, form security point of view, an external and untrusted area. Connections happening outside of the external interface are considered unprotected and unfiltered, unless a service provider is using additional security procedures to monitor and protect this network. 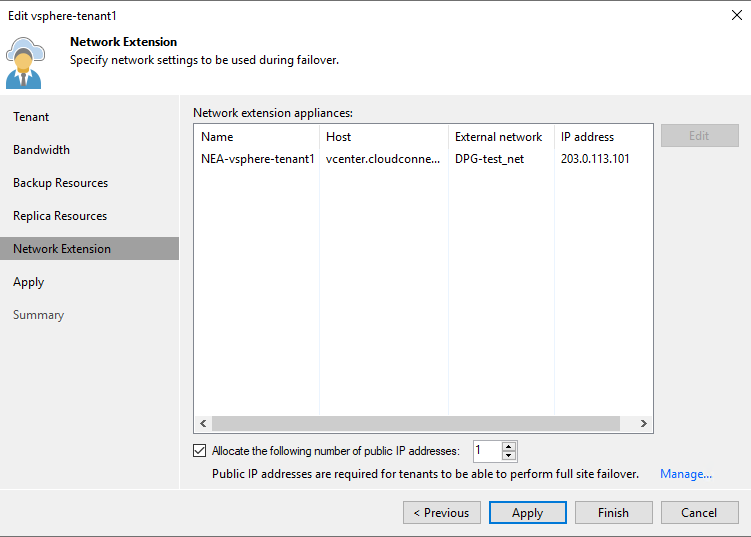 Note: Tenant NEA has only ONE network interface. If the tenant has received from the service provider multiple networks, one NEA will be deployed for each network. 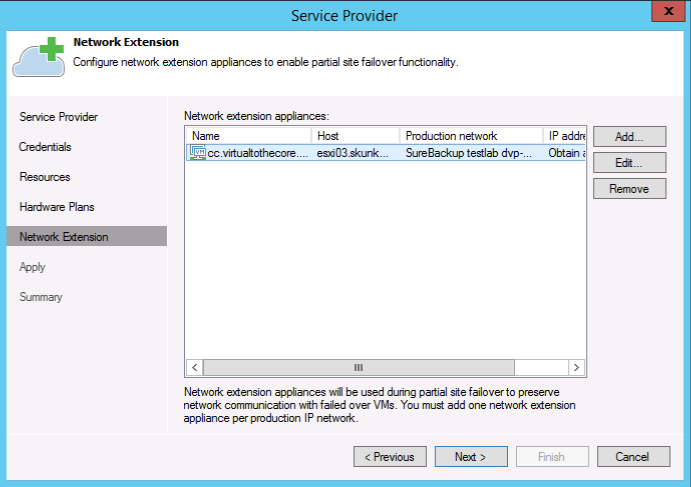 At the service provide however only one NEA with multiple interfaces will be deployed.